Edible algae, more commonly known as seaweed and collectively called sea vegetables, comes in a range of shapes, tastes and textures, and it's not just for wrapping sushi rolls. While some parts of the world like Japan, China and Korea have embraced seaweed as food for centuries, few Westerners put seaweed on their weekly grocery lists. There's reason for you to considerate adding it, however. Seaweed is rich in essential vitamins and minerals and naturally low-fat. Seaweed absorbs minerals from the sea, making it a concentrated source of trace elements needed for human nutrition. A typical serving of dried kombu seaweed contains significantly more calcium than a cup of milk, according to the European Food Information Council. Seaweed is also rich in iron, magnesium, potassium, zinc and vitamin K and contains useful amounts of vitamin E, riboflavin, thiamine, niacin and folate. In addition, seaweed is high in soluble fiber and, if you're like most Americans, you're not getting enough. A bonus if you're vegetarian: seaweed is one of the few plant sources of B-12. Nori is one of the most common types of seaweed. Purplish-black in color, with a very thin and flat texture, it has a slightly sweet, somewhat meaty flavor. It's one of the most nutritious types of seaweeds. Kombu is a large, thick, brown alga with a savory, mushroomlike flavor. Brown algae are known for their rich iodine content, which is lacking in nori and other red seaweeds. Dulse is another common seaweed; it's a thin, red alga with a nutty, smoky flavor. It's richer in nutrients than spinach, according to the Food and Agriculture Organization of the United Nations. If the nutrition value of edible algae is not enough to convince you to add it to your diet, consider that brown seaweed may prevent cancer, according to a review published in the September 2013 edition of the International Journal of Biological Macromolecules. Fucoidan, a major polysaccharide component of brown seaweed, causes death in cancer cells and prevents cancer from spreading and invading healthy cells, wrote the authors of the study. 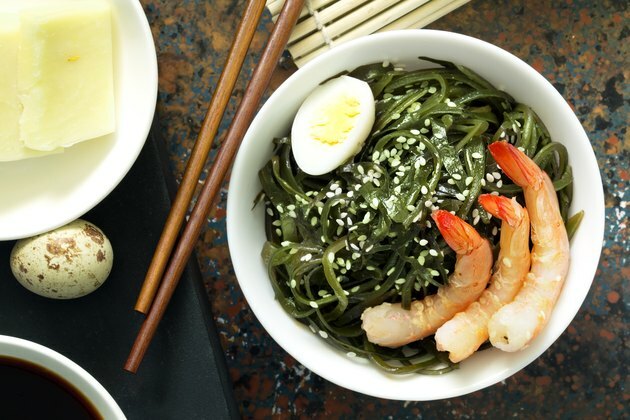 Seaweed is a versatile food, making it easy to add to your diet. Add dried flakes to your soup stocks to enhance salty, savory flavor profiles. Saute fresh seaweed in stir-fry dishes, or use it in place of other dark leafy vegetables in your salads. Experiment with different recipes, adding it to casseroles, pasta dishes and stews, as well as lightly toasting it and eating it as a snack.